There is nothing I wish for more than having my make-up carefully organized a la Pinterest. I envisage a whole room dedicated to my make-up storage where everything will be organized to within an inch of its life. I will have pull-out double-layered drawers, cupboards filled with eyeshadows which have been organised in colour order, fresh make-up brushes on hand whenever I need them... That really is my dream. Someone who lives my dream is Shaaanxo. She posted her make-up collection video on Youtube a couple of months ago and, oh my god, it is probably one of the best videos I have ever watched. I was in awe watching it. If you love make-up then I advise you watch her video as you will watch it with your mouth hanging on the ground. Also, if someone tells you you have too much make-up then tell them to watch her video and they will quickly apologise to you. Until recently, my make-up storage consisted of one big old Primark make-up bag and a white cardboard box from Ikea which I actually had to build myself. My make-up brushes were all shoved into a pink and white ceramic pot which was too small for my ever-growing make-up brush collection. I knew my make-up organisation needed to be, er, organized, but there was only one thing stopping me. I don't have another room to turn into my make-up room. My bedroom is the smallest room in the house - I need all of the space I can get! Of course, Muji is the first port of call when it comes to storage of any kind and as tempting as the ever-popular Muji 5 drawer acrylic box is, I decided to have a hunt for some cheaper alternatives first. I very rarely go to TKMaxx and by rarely I mean never but oh my goodness people, we are missing out. The make-up section alone is enough to take a visit but beyond that, they have clear, acrylic make-up and cosmetic storage for under £10. 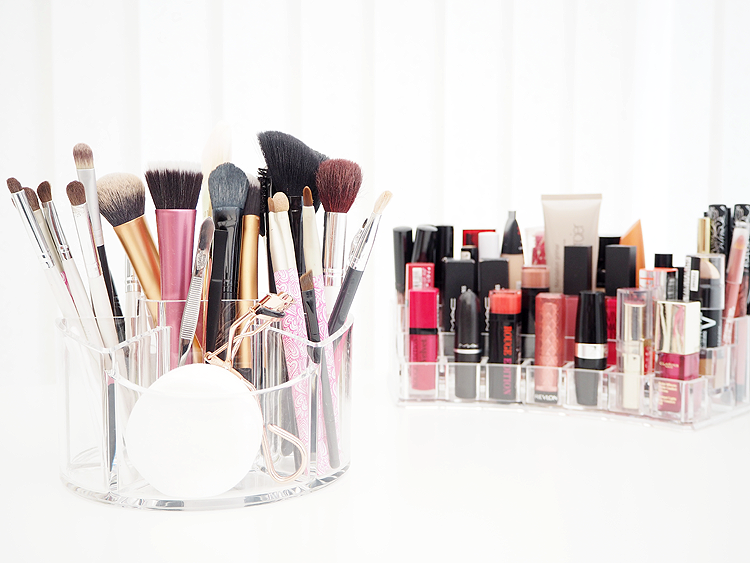 We're talking brush holders, lipstick holders, sets of acrylic drawers a la Muji.. I spent two hours trying to decide what to buy and in the end, I had to buy it all. I bought a lipstick holder which fits 24 lipsticks, a brush and tool organizer and a 'bit-of-an-everything' organizer. I was so excited to sit and organize my main make-up and brushes into their new storage, although I had to return the lipstick holder as I don't own enough traditional lipsticks to sit in the holder properly. The brush and tool organizer has made life so much easier as I can now see all of my brushes as well as organize them into sections and I have plenty of space for lots of new ones. It also means I now have space to hold cotton pads, cotton buds and my beauty blenders. If I had hundreds of make-up brushes then I would definitely pick another one of these up as they are just so handy to store everything in. The other cosmetic organizer I picked up is where I store all of my immediate make-up items, as well as a few of my liquid lipsticks as there is deep little sections within the organizer where they stand up perfectly. In this organizer I keep my foundations, mascaras, concealers, Kylie Lip Kits, eyeliners, lip liners and a few lipsticks. I really want to try and keep everything as upright as possible so this organizer makes this much more possible compared to when everything was shoved into a make-up bag. This organizer has many uses and you can store so many items in it so it is definitely multi-purpose. I now need to find an organizer to keep all of my eyeshadows, palettes, blushers, highlighters and everything else which currently doesn't have it's own home. I may end up having to buy a Muji 5 drawer organizer to store everything else in, although moving to a bigger house may be another option too. I think if you were on the hunt for some really affordable cosmetic and beauty storage then definitely take a look around TKMaxx if you live near one. Everything is so inexpensive and affordable and whilst you're there, you can buy more make-up to fill the storage up with too! I love the one you have your brushes in! I have some storage drawers which I got off ebay quite cheap but they are amazing. I've bought a few acrylic makeup organisers here and there (even found one in pound land!) but I absolutely hate them, so i'm always looking for new types and these are lovely! These look very nice! I also have similar organisers. 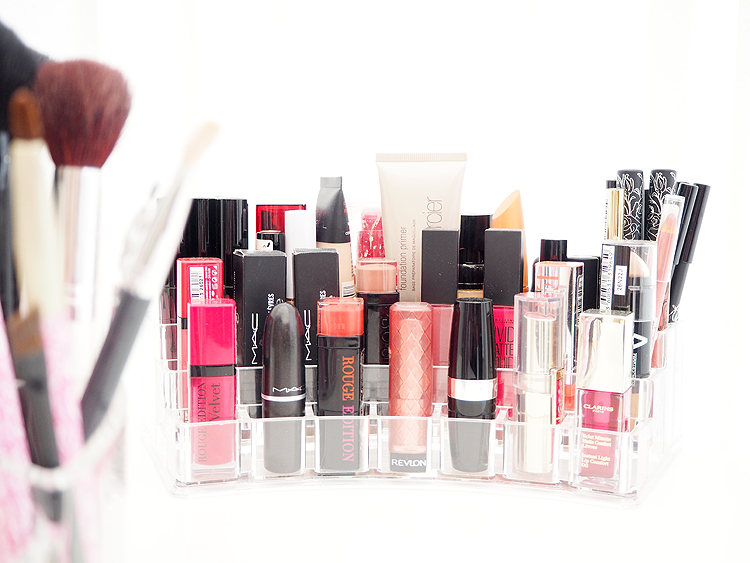 There's nothing more satisfying that your makeup being organised! They sell some great makeup storage in TK Max too! I have something similar. So helpful! I love the lipstick organisers I just don't have enough to go in them! These makeup organisers look absolutely gorgeous! Oh my gosh I watched Shannon's video as well before and I was in awe, It's incredible! If you have a look on Amazon they do some really good pieces, most of my acrylic storage is from there! Other // A Small Colourpop Giveaway!